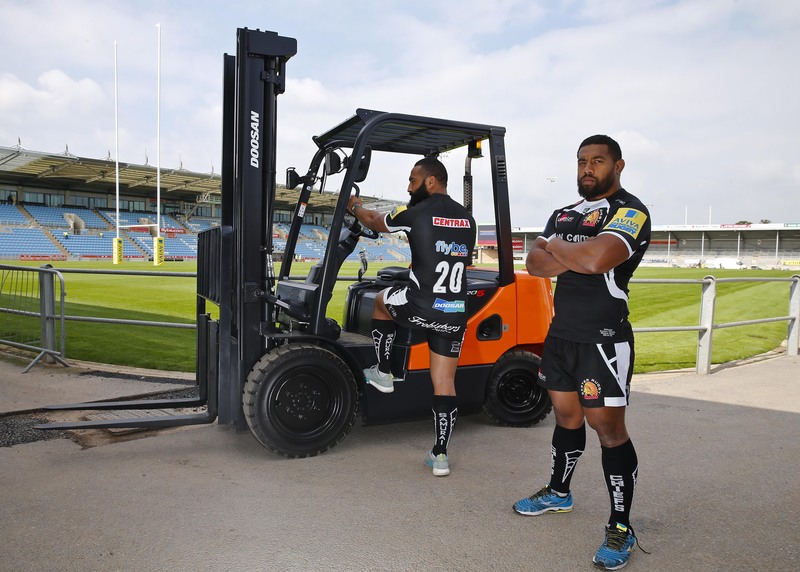 Leading forklift truck provider Doosan Industrial Vehicle UK is proud to announce its sponsorship of Aviva Premiership rugby union team the Exeter Chiefs. The Doosan logo will be carried on the club’s first XV shirts throughout the 2014/15 season. The partnership got off to a winning start for the first game of the season – with the Chiefs thumping London Welsh 52-0. Doosan has strong links with the South West, supplying forklift trucks through the dealer Westexe Forklifts, which has depots in Exeter and Plymouth. The South West is an important region for Doosan as it is emerging as a strong area for retail growth in warehousing, and consequently forklift sales, with Farm Foods opening a large warehouse in Avonmouth this year, and other companies also looking for space around Avonmouth, thanks to its proximity to the M4 and M5. Exeter Chiefs are building on a successful 2013/14 season which saw them win the LV= Cup, and are aiming to go on from strength-to-strength in the 2014/15 season. Tim Waples, Director of Doosan Industrial Vehicle UK said: “We are very pleased to join Exeter Chiefs at such an exciting time for them. The Chiefs are strong, rugged and powerful, like our vehicles, so here’s to success for us both in 2014/15. Doosan is the market leader for diesel forklifts and also supplies LPG and electric powered trucks to cover all working environments and applications. The company also has a heavy duty, quality warehouse range is built at its German manufacturing base and even a Doosan Ice range designed specifically for cold storage and sub-zero (to minus 35?c) working environments. Doosan’s dealer-based route to market means customers receive the prompt and personal local service they want, backed up by support – not to mention factory-gate prices – direct from the manufacturer. Doosan is also very active in its support for sport around the world. In addition to its sponsorship of the Exeter Chiefs and the British Open, it also sponsors Europa League Czech football side Viktoria Plzen, the Doosan Bears baseball team and NASCAR’s Joe Gibbs Racing.